Now, whether they say that out loud or not, most people are going to take you more seriously when they learn you’ve got a book or two out. As a writer or freelancer, it’s pretty much money in the bank. You can add the book to your site and plaster its snazzy cover all over your promotions. So you’re a published author. Wow, I’m impressed. It’s an excellent incentive to offer to new subscribers too… so they’ll join your mailing list and discover all the ways you can help grow their business (and all the ways they can help grow your business too!). What’s the easiest way to self-publish an eBook to give away at your site? Here are the six steps to get you from hobby writer to published author. If you already have your own website, presumably you’ve got some articles on it. Your eBook can simply be a compilation of the thematically-connected content from your site. Easy! But if you don’t yet have any attractive content available, you can either write it or outsource it. Writing should be easy. After all, you’re a writer. Or you could outsource the writing task to a freelancer. Place an add on Upwork or even in relevant Facebook groups letting people know you’re in the need of a ghostwriter. And the easiest way to get this step done is at Fiverr. For just a few dollars, you can get your content formatted and compiled (that’s two separate processes) into both ebook formats. If you use Scrivener, as I do, it can spit out both formats for you. Your Fiverr person can deliver both formats with ease. 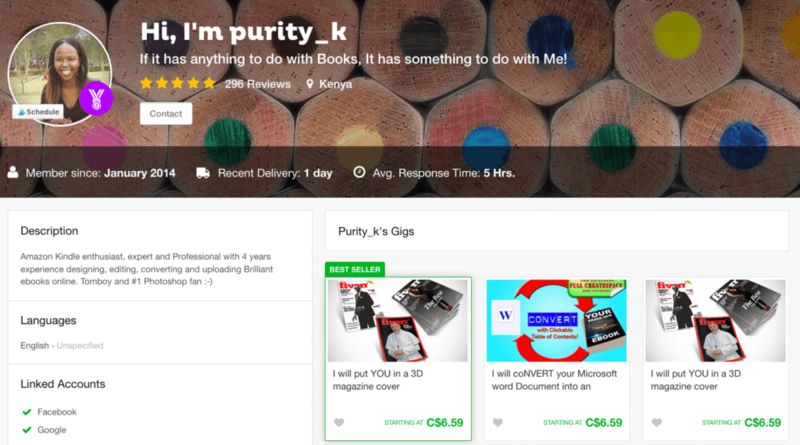 Not familiar with Fiverr? Enter your search term such as “amazon ebook” and then hover over each provider’s image and you will see their star rating and how many reviews they’ve had. Purity_k has a 5 star rating from 296 reviews, so we know she does great work. 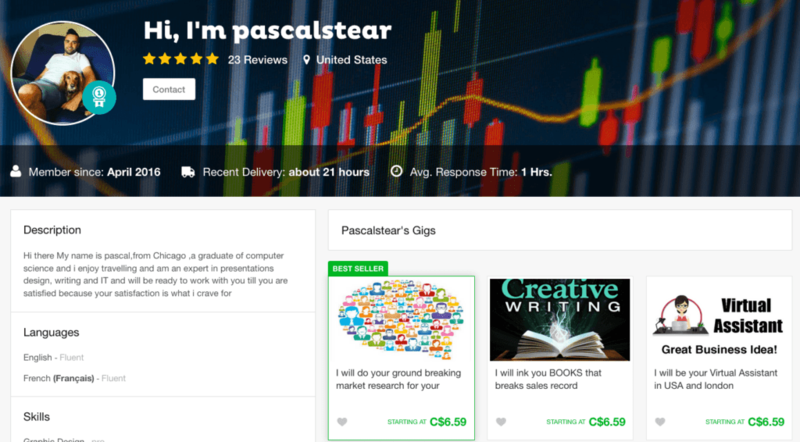 Pascalstear is also rated 4.9 but from only 23 reviews. That’s not necessarily bad because new providers are keen to impress! He also offers to help promote your book. If you would prefer to buy from the UK site, you can do so by inserting “uk.” (with the dot) before the links I’ve provided. Some providers are only on one of them; some are on both. Often all you need is the provider’s cheapest or second cheapest package. Their reply gives me a feel for the level of professionalism I might expect with this gig. I might also ask how many revisions are included. ECover is short for eBook cover. It’s the image which helps to attract people to download your eBook. Some providers will use images from their own collections but personally I like to give them an image which I know I have the appropriate commercial rights to. TIP: If I am downloading an image I’ve bought from a photo-sharing site, I always take a screenshot of the receipt page and save it with the photo. It gives me peace of mind. I don’t take this lightly because I’ve read too many scary stories about eBook authors being pursued by lawyers from the big photo companies. Just grabbing a photo from Google Images is a big no-no. Okay, let’s get back to having your eCover made. 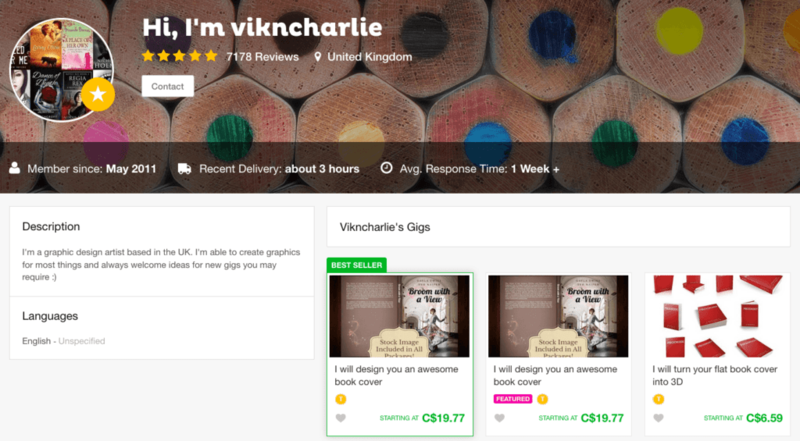 We’ll use Fiverr again. Here are two graphic designers I’ve used in the past. Vikncharlie is rated 4.9 from 7,173 reviews. Awesome! I like this gig because you get a licensed image from Shutterstock. That eliminates any risk of your designer using an image you don’t have legal rights to use. Alternatively you can ask the designer to use an image you supply. Pro_ebookcovers is rated 5 from 21,193 reviews which is even more awesome. She includes unlimited revisions and a stock photo. I call that win/win. Why Draft2Digital? Two reasons, actually. They will distribute your .epub ebook to Apple iBooks, Kobo, Nook and three other online etailers. All at no charge to you. At Draft2Digital, you can set the price at zero. Now the big daddy of them all, Amazon. Visit Amazon Self Publishing to upload your .mobi file. Important: Leave “Enroll this book in KDP Select” blank or you will designate Amazon as the exclusive distributor of your eBook. And you do not want that. Why? Because once your book is live on Amazon at 99 cents or whatever price you choose (and it doesn’t matter), you will use the “Contact us” link at the bottom of your KDP screen to ask for price matching. A simple courteous message like this will usually do the trick. ASIN is the Amazon tracking number for your book. The link is to the sales page of one of the D2D bookstores from step 4. Remember to use keywords in the title, subtitle and description. And what about, “Do not enable digital rights management?” Leave that blank too, because this is your giveaway book and you don’t mind if others help you share the content. After all, your book has plenty of your links in it, right? In a few days, your smart new eBook will be free on Amazon and several of the D2D etailers and you can begin to promote it. Offer it at your site as an incentive to subscribe. If you don’t yet have a website of your own, you can get good web hosting advice here. Once your book is on offer at your website, then it’s time to share the link across social media. Seeing how easy it is to add, “Published author” to your bio, what topic will you be covering in your first eBook? Share your ideas in the comments section below. What Makes a Good Freelance Writer Headshot? Great article, Gary. You’ve given new authors who want to publish online a step-by-step path to get it done. Glad you mentioned publishing at Draft2Digital first. That could easily be overlooked by a new author. How right you are. D2D is not as well known as “big daddy” Amazon, but they are doing a great job – and can certainly help getting your ebook out there among more readers. You make the process seem so simple and doable, Gary. i have been thinking about publishing ebooks as an alternate income generator as well as lead magnets for biz clients. Your article has reignited the passion to push forward with these ideas. Thanks for sharing your insights. Glad it’s helped light the fire again, Karen. I’m thinking the greater value is probably going to be as a lead magnet. Once your ebooks are online and available for purchase or free download, they are passive promoters (or a passive income stream). And continuing to get results from a one-time activity in the past is always a bonus. Great step-by-step guide Gary, you’ve definitely covered the basics and I’m sure this will help anyone new to the process. 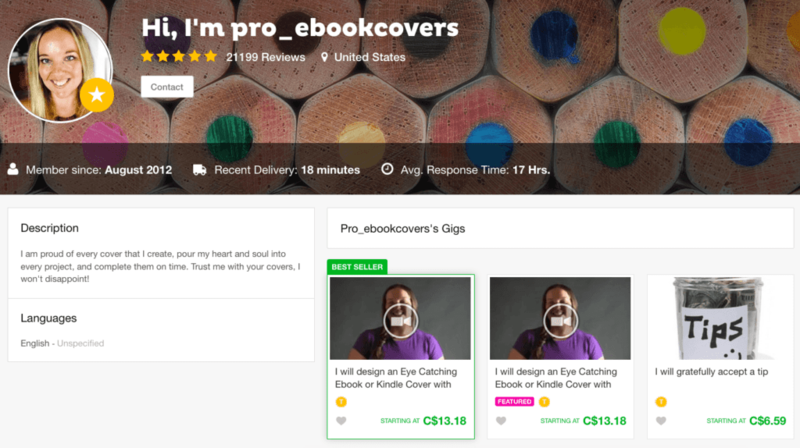 Fiverr is a good suggestion for an ebook cover, particularly if you’re just starting out and need to keep costs down. The main thing is to dig in and get your books out there. After the first one, it gets much easier! Indeed, it does get easier after the first time. I think that’s true of almost everything online, isnt it? When I read that something is intuitive (meaning the writer thinks it’s so obvious that you don’t need instructions), I usually find I cant do it. Grrrr. Often “stuff” is created by programming whizkids who don’t take other people’s realities into account so well. There’s nothing like a simple set of step-by-step instructions… which is what I’ve tried to provide here. Mind you, there are still a lot of details to be encountered in the process and many of those might vary according to which computer you’re using, for just one example. Thanks for commenting, Carla. It was good to be able to share “the voice of experience”. I’m grateful to Elna for accepting my pitch. As you say… let’s do this thing! My 6 e-books continue to generate passive income for me every month.